Lee's Life Adventure: We're getting a bike park!!! We're getting a bike park!!! Sonoma County is getting a bike park! With a UCI length velodrome! Now in reality, there are still a million hurdles to cross but this project is happening and I can hardly wait. What makes me so sure? For starters, it is the dedication of a small group of people who got this project off the ground and the progress they have made bringing the right groups on board. The Sonoma County Velo Project (SCVP) is the brain child of a handful of individuals who recognize the recreational, educational and business prospects of building a bike park in Sonoma County. As I have written before, Sonoma County has become a cycling mecca and a world class destination for cyclo-tourism. We have many current and retired pro-cyclist who call it home. And Santa Rosa has hosted a stage finish for the Amgen Tour of California every year since its creation. So, this is a natural fit. Whenever you launch a dream as big as this there are numerous things that will immediately stand in your way such as volunteers, funding and government support. I am happy to say that these hurdles are being crossed very quickly and hence my excitement. On April 14th, SCVP met with the City of Santa Rosa Parks and Recreation Department to discuss building the bike park in an unused portion of an existing city park. I'll let you read all of the fine print but the bottom line is that the Parks & Rec folks climbed on board immediately. The next step was a presentation to the Board of Community Services (BOCS). The plan was presented to them at a public meeting on April 22nd. During this presentation, which was attended by many in the cycling community including myself, Scott Bowden did an excellent job of presenting the value of a bike park. The comments after his presentation were inspiring. I have never heard such glowing comments and strong support for a project. And, here's the key, these comments were not coming from the cyclist. They were coming from the BOCS Board Members. Afterwards, many of us stood at the microphone and offered our support including 2 of our local shops offering funding to the project if it proceeds. Well you can imagine the result of their vote. 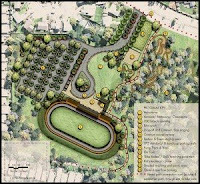 In an unanimous vote, the advisory Board of Community Services (BOCS) to the City of Santa Rosa approved the recommended process of moving forward with the investigation of the proposed Sonoma County Velo Project at Youth Community Park in Santa Rosa, CA. So we have City government behind us. They won't be able to fund any of the project in this economy but they help clear road blocks. We have the beginning of a funding campaign. Now we need the volunteers. I intend to be one of them. And you should too! It's time to getinvolved. There are bike parks such as ours springing up all over the United States, In places like Boulder where you expect this type of outdoor park. But also in cities and states such as Fresno, Florida, Arizona, Seattle and many, many more. There are a number of these projects still in the planning stages with plenty of opportunity for you to help. I cannot thing of a greater legacy to leave for the next generation of cyclist.